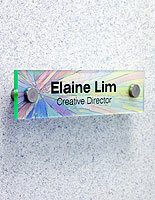 3" x 6" 6" x 6" 8.5" x 11"
These office door name signs measure 8”x2” with a printable label to customize a business space. 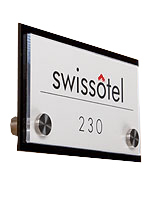 Nameplates are great for identifying a room, lobby, or conference room. 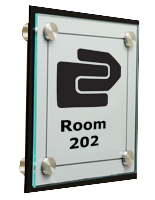 The door name signs are a do-it-yourself printing system, which saves your company money. 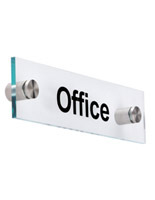 Simply design a label, print the label, insert it between the 2 acrylic plates and mount it to the wall using the stainless steel mounts. 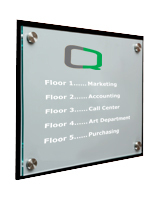 The door name signs are signage that creates trouble-free navigation in a business. 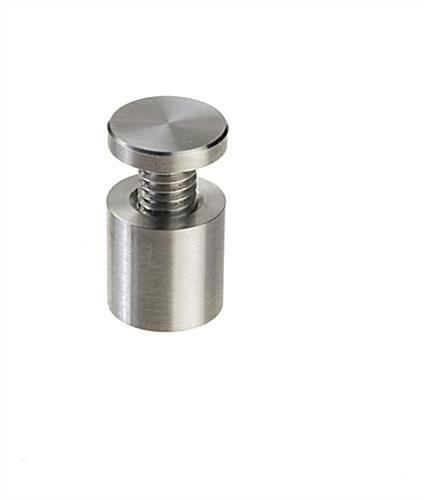 Three templates are provided for the custom made labels to make the designing process simple. 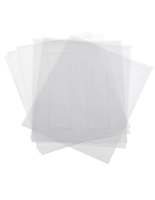 One type of film are also available with the displays; frosted. Printing can be in B&W or color on the film, but can only be used with laser printers, not inkjet printers. 8.3" x 78.0" x 1.0"
I was looking for something to really make my project stand out, and these sign plates really did the trick. Thanks Displays2Go!! 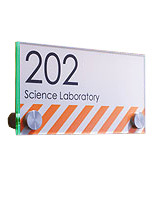 We purchased 30 of these to update the door signs on our office. As such, the displays look good. However, removing the cut-out after printing takes a lot of time. Additionally, the cut-out has serrated edges after removal. From a distance it looks good. However, from a close up, it does not provide as professional look as you would expect. We are sorry about that, Nagesh. We will pass along the suggestion to our team that creates the templates. If you are not satisfied with your item and would like to discuss returning it, please contact our customer care team via phone, live chat, or email and they will be happy to assist you. 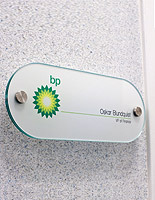 These name plates are a great look for a good price! 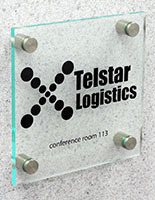 They match other signage around the building, which is much of the reason we chose this style. They are easy to assemble and hang, as well. The only thing I was disappointed in was that the description made me think I would have access to several printable backgrounds as part of the purchase price. The access, however, is simply a website where you can go to purchase them, so I made my own. Overall, we are very happy! Template and hardware provided is very easy to figure out/install.